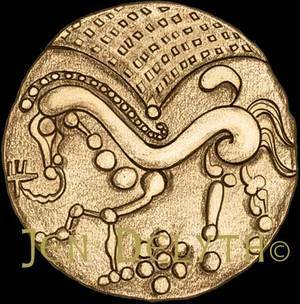 This Solar Horse Symbol is from a Gold Slater (Celtic coin) minted by the Parisii Tribe, end of second, early first century BC. Solar symbols are among the most powerful for the warrior Celts, associated with the Horse, the Bull, the Swan, and the sun gods Lleu and Bel. The Horse as solar animal embellishes the coins, bronze mounts, harnesses and richly decorated grave goods that are destined for the Otherworld. Coins provide some of our most interesting insights into Celtic symbolism and culture, since each tribe minted its own disks with sacred iconography including the heads of tribal kings and chieftains. Gold Celtic coins often feature the Horse, the Boar, the Raven and sun chariot wheels. This illustration of a solar horse with dots and other strange marks may signify astronomical relationships. The metals gold, bronze and iron are associated with the sun and with the warrior hero gods Lugh and Nuada. The Sun represents fertility, power and strength – the stuff of warriors – and the esoteric sun wheel symbol is frequently paired with animal and chieftain figures on Celtic coins, which are in themselves like small golden sun disks. These are powerful symbols associated with wealth, and through them the gods of the Iron Age Celts of Europe lent their favors to the tribes of the metal masters.